Let there be light always. Don't forget them. 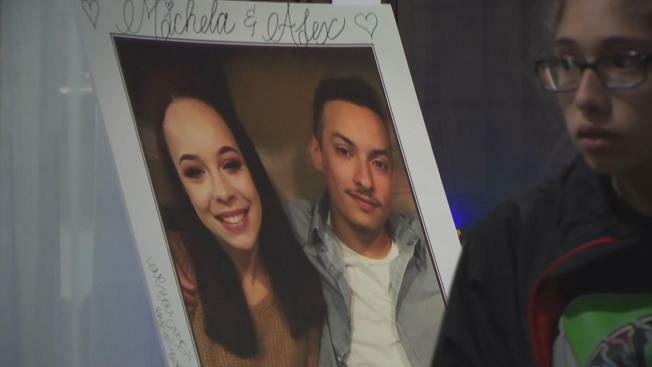 That was the theme of a vigil Wednesday night in San Bruno honoring Alex Vega and Michela Gregory, both of whom died in the Oakland warehouse fire. Standing in the rain, hundreds of mourners gathered at the Vega family home to say goodbye to 22-year-old Vega and his girlfriend of five years, 20-year-old Gregory. So many showed up for the vigil, there were people overflowing into the street, many sobbing in disbelief. As she held on to a photograph of her son, Vega's mother prayed the rosary and thanked everyone for loving her son. "I see my son is well loved," Maria Vega said. "He's with the love of his life." Vega and Gregory were inseparable in life and in death. The Alameda County Sheriff's Office said firefighters found the high school sweethearts in the warehouse in each others arms. Gregory's father said he knew they would be found together. "They were trying to get out together or helping each other," David Gregory said. "I knew it and felt it. It gave me peace knowing." Family and friends searched for peace and leaned on each other as they grieved. "I want to thank everyone who has come out to pay their respects for unbelievable kids," David Gregory said. "They just wanted to have fun; this never should have happened."